Every single building in Prague looks like touched by magic. The city mercilessly takes you to the old times when Prague was one of the most splendorous cities on the globe. Classical music, paintings and imposing architecture were its hallmarks. My friend was guiding me -astonished and caffeinated- to the next cafe. Dos Mundos -Two Worlds- is the name of our next halt. 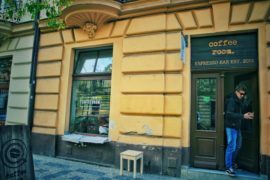 That is the cafe-showcase from one of the vigorous Czech Roasters which names it. Our journey took us round the twisting streets harassed by its haughty edifices. The city, coated by beauty and elegance, made me excited to explore its wonders. It is interesting to see the unique symbiosis resulted from all the different architectural styles, from Romanesque to Gothic, houses and palaces erected by Baroque and Renassaince’s hands. In this spectacular mosaic, a feeling of order and harmony accompanies even the most caffeinated minds. We were walking up the hills protecting one of the sides of Vltava river, when we finally spotted the Technical National Museum in front of us. We knew we were quite close. Few minutes more, ignoring the ugly National Museum of Agriculture, and we would get there. Dos Mundos was being blurred by the unflagging trams that crossed the big avenue. The avenue where the scene was born. 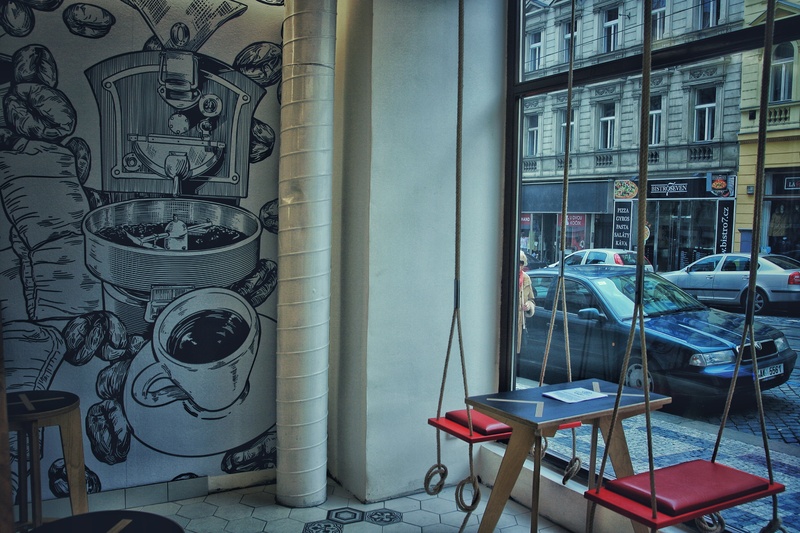 Hey, do you remember those cool swings from Playground Coffee House? Well, there is a big walled glass in the entrance, like a window, which lets you browse a table with frolicsome swings. But that is all you get to see from the Bristolian Playground here. Dos Mundos plays with clarity and lights. White flood all around the cafe. There are light wood colours strangely evoking some deeply personal feel. Above the two worlds painted on the wall of the bar you have one of the most beautiful and magnificient machines. I knew many people would do whatever it takes to get their hands around that San Remoi Opera. It is guarded by one Mahlkonig Peak and smiley baristas, who kindly show us around and serves us nicely. Can you ask for a better set up? Once we take a seat -on the swings- our coffees start coming. The swaying directs my eyes to look at the tiles: white diamonds with intricate designs. Before I realised I followed them and left my swings in good hands, some overexcited kids came to the cafe. Undoubtedly, this is one of the most beautiful and nurtured coffee shops I have ever seen. 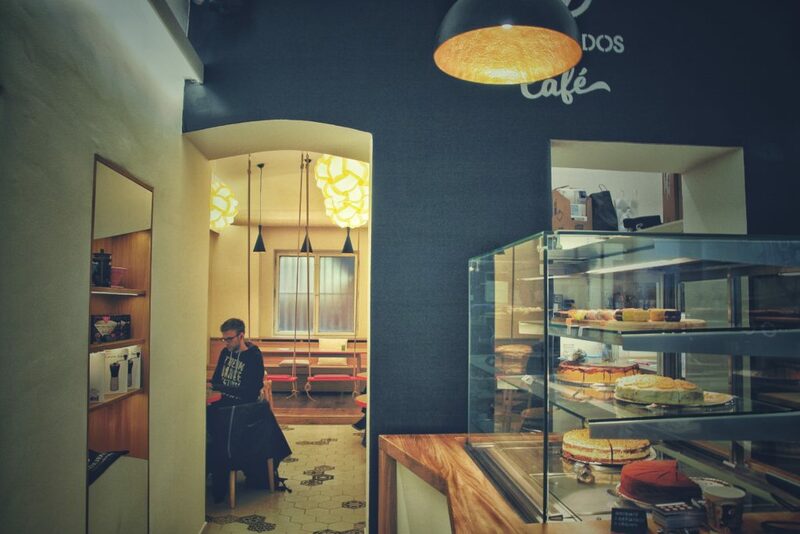 We opened Dos Mundos Café the 21st October 2017. It is our second project after our roastery in Prague 2. The roastery is a shop and espresso bar and we decided to create a pure Café experience this time. We were looking for a speciality coffee shop/café with excellent equipment which would be a valuable example for our wholesale customers, as we are primarily roasters. After 3 months in service, we are satisfied with the Café´s performance and we want to bring even better speciality coffee experience in future. 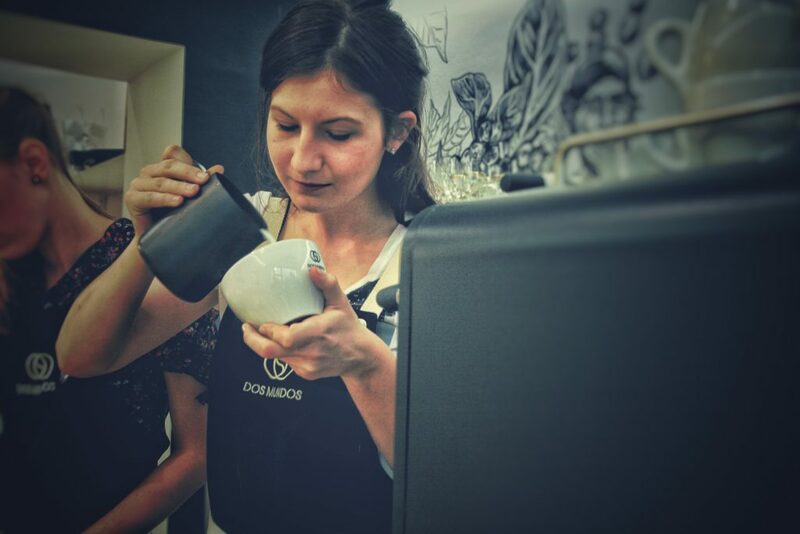 MEET THE BARISTA… ADELA Z. 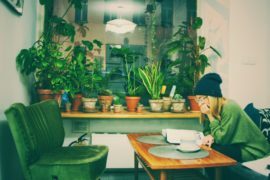 When we realised we have about half a ton of green coffee in a living room we decided with my husband to transform our passion into business. This was 4 years ago. 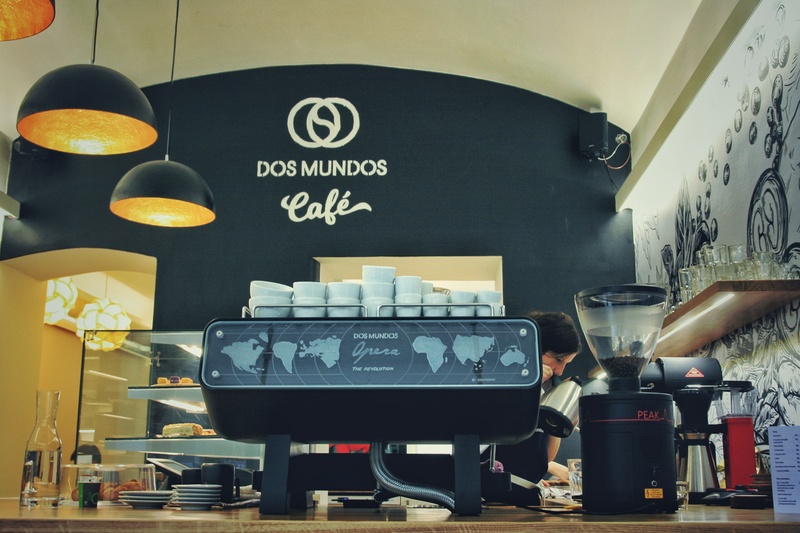 Since then we opened our roastery and this year also Dos Mundos Café. HOW WAS YOUR FIRST EXPERIENCE AT DOS MUNDOS CAFE? We opened 1 day before Prague Coffee festival. So all coffee enthusiasts from Europe were in the city. Being judged after 1 day of service can be really challenging, but coffee people are very kind and fortunately we received very good feedback. WHAT IS DOS MUNDOS FOR YOU? It is my passion. I keep thinking every day how to make it even better, more effective, more comfortable for customers, and more profitable. And I am very proud of my team who work everyday with professionalism and a smile upon their faces. One good experience. – When finishing the reconstruction of the Café, we had to hang swings, suddenly realising one of the ceilings is almost impossible to go through. After two hard days we found an Ukrainian guy with some kind of adjusted “gun for walls” who was able to shoot the swings in the wall. He was so happy he could try his new toy, that he did it for free even though every shoot cost him about 500 CZK. Oh, right now I really love Ethiopia Guji natural brewed on V60. Strawberries, toffee… simply awesome. 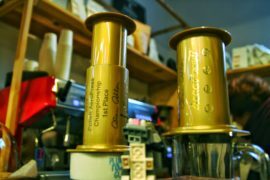 GRINDERS: Mahlkonig Peak and Macap M7D for Espresso. Mahlkonig EK43 for Filter.